By clinging to the past misdeeds of some Islamic rulers, present day Muslims are making reconciliation of communities an impossibility, says Colonel Anil A Athale (retd). In these times fraught with armies of trolls ready to pounce on you to label one as a 'bhakt' or 'sickular' at a drop of hat, it is necessary to make a disclosure about one's beliefs ab initio. I believe in a secular and free India where all faiths are welcome and have equal rights. But I am also conscious of the Indian historical heritage that makes India unique as a civilisational State. I also believe that the true calling of history is the search for truth, howsoever unpalatable it may be and be regarded as politically incorrect. In an earlier judgment of a three-member bench, the Supreme Court asserted that it is looking at it as purely a property dispute. The layman's understanding of the role of the Supreme Court is that it is a forum that deals with issues only when the interpretation of law or Constitution is involved. It was in that sense a departure from norm. When the Chief Justice of India announced a five-member Constitutional bench, he further signalled the extraordinary importance of the case. Surely the dispute over the small piece of land is historical in as much as the original litigation goes back to 1950. But more than being historical, it is also a dispute about history. 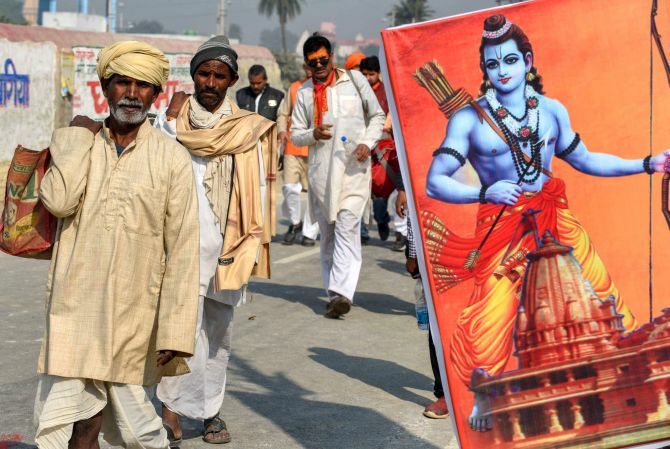 The people opposing the temple at the birthplace of Shri Ram claim that there never was a temple that was demolished. While those proposing a Ram temple in Ayodhya claim that a temple was destroyed and a mosque was built at that very place by Mir Baqui, a general in Babur's army in the 16th century. The matter took an even more curious turn when the erstwhile UPA government filed an Orwellian affidavit (in another matter) claiming that Ram was not a historical figure but a 'myth'. The matter had already been muddied when in the 1970s and 1980s, as the demand for the construction of a Ram temple at his birthplace peaked, a cabal of Delhi-based 'eminent' historians claimed that the original Ayodhya was either in Afghanistan or even in Thailand (where there is an ancient town by the name of Ayodhya). A Delhi-based 'eminent historian', who specialises in ancient Indian history (without knowing Sanskrit), spearheaded the movement. Even the Baburnama, the record of Babur's rule, could not throw much light on the issue as the 20-odd pages dealing with the episode were 'missing' from the original held in the British Museum. The clever British saw great potential in the Ayodhya dispute to continue with their 'divide and rule' policy and the pages of Baburnama going missing is par for the course for British intrigue. Before the Anglophiles (of whom there is no dearth in India's English-speaking elite) jump at my throat, let me share an incident that happened to me in July 1991. I was then in London's India Office Library and Records working on the history project on the Anglo-Maratha wars as a fellow of the Institute of Defence Studies and Analysis, New Delhi. I had done my homework before reaching there and wanted the Court of Director's documents dealing with the Battle of Assyee 1803 between the Marathas led by the Scindias and Arthur Wellesley (later the duke of Wellington who won the battle of Waterloo against Napoleon). After waiting for nearly two days, I got a stock answer that the documents wanted by me were 'missing'. Frustrated at these delaying tactics, I sought a meeting with the director, one Mr Carrington, and bluntly told him that if the documents were not made available to me I would draw the conclusion that the British wished to hide the truth about the battle even after 200 years and that I would mention this in my work. He then asked me why I was working on this battle when there were enough accounts already available that showed that it was a British victory. Luckily, I was carrying with me a copy of Philip Mason's popular version of the history of the Indian Army where the author completely omitted to mention the British defeat at the hands of the Marathas in the Battle of Wadgaon (January 13, 1779). Then I drew his attention to the official history of the British army that clearly brought out the facts about the British defeat. I then went on to say that I want to search for the 'truth' about the Battle of Assyee, by far one of the most decisive battles of the second Anglo-Maratha war. The reason to narrate this elaborate story is that the reason for the missing 20 pages of Baburnama may not be simple negligence, but part of well-crafted British policy. Those interested in getting at the truth about British 'tricks' are requested to go through the biography of Eric Blair, popularly known as the famous author George Orwell. As a police officer between 1922 and 1927, he was disgusted with how British provoked communal riots by throwing pig carcass into mosques and beef into temples. Denial of the historicity of India's ancient past has long been a part of British colonial enterprise. Western historiography regards all events pre-Christ as a 'myth'. Interestingly, even the existence of Troy, mentioned in the Illiad, was denied right till 1993 when archeological excavations proved conclusively that Troy indeed existed and the Illiad was not an imaginary story. Indian historians who deny the existence of Ram ignore the existing evidence on the Java island of Indonesia at Prambanan and other places where the Ramayan story is depicted in murals. These artifacts date back to the 5th century. It is intriguing that this 'evidence' is well preserved in a country with the largest Muslim population, Indonesia, and is located in Java that has 95% Muslim population. The largest Hindu temple in the world is in Cambodia at Angkor Wat. It has a brass relief mural of the entire Ramayan dating back to the 12th century. To question the historicity of Ram in the face of evidence in India, Sri Lanka, Nepal, Indonesia and Cambodia is the new 'myth' created to suit current prejudices. Destroying prominent temples which could act as a focal point of resistance was a common practice of Islamic rulers. The Krishna Janambhoomi in Mathura, the Kashi Vishwanath temple that is now the Gyanwapi mosque are some examples that come to mind. Invaders also disliked grand Indian monuments and made sure that they were destroyed. Even the British were no exception to this rule. On February 17, 1828, a 'mysterious' fire burnt down the seven storied palace in Poona, at that time possibly the tallest building in India. The British made sure that this symbol of Maratha power was destroyed. Babur and many others viewed temples in the same light, and added to this was the Islamic zeal of destroying statues as 'duty'. It is a historical fact that the Marathas, when they marched to Panipat in 1761 to face Ahmed Shah Abdali, had a far grander plan to also 'liberate' Hindu holy sites from Mughal control. The war directive issued by Peshwa Balaji Bajirao explicitly mentions this. Attracted by the opportunity to visit holy sites, a large number of family members of the Maratha soldiers accompanied the army. Defeat at Panipat put paid to those plans, else we would not have had the Ayodhya dispute at all. This is no figment of my imagination. When the Marathas took over Malwa, General Ranoji Shinde destroyed the mosque built by Sultan Iltamsh in 1234 and re-established the famous Kalbahireshwar temple in Ujjain in 1734. Even the current Kashi temple is built by Maratha queen Ahilyabai Holkar. The final clinching argument about the existence of a Ram Janambhoomi temple is circumstantial. The very location of the erstwhile mosque in a congested locality, surrounded by numerous temples of Hanuman, Sita etc, makes it inconceivable that the place would have been empty. A lack of written account about the temple is a perennial problem faced by all Indian historians. As I researched Maratha history, one had to perforce rely on secondary documents since the Maratha daftar (government documents) located at the capital at Raigad, was destroyed by the Mughal general Zulfikar Khan in 1689. In the case of the history of North India, the great libraries of Nalanda and Taxila were burnt down by the invaders. The idea was to wipe out the past. Finally, the fact is that Christians have their Bethlehem, Jerusalem and Rome, Muslims have their Mecca, Medina and Karbala, but in the Hindu holy places of Mathura, Kashi and Ayodhya there are mosques! Would it not be generous on the part of Indian Muslims to restitute these holy sites to their rightful owners? Indian Muslims have made tremendous contributions in preserving Indian arts and culture. Ibrahim Khan and many more fought bravely for their country at Panipat. By clinging to the past misdeeds of some Islamic rulers, present day Muslims are making reconciliation of communities an impossibility. Why does the present generation not jettison the ugly past and make a new beginning? They would find many supporters like me in their 'real' fight against economic and social insecurities.